The Gotoh 5th String banjo peg the perfect replacement for that old broken 5th string peg or to upgrade your banjo from a friction peg.Fitting is 8mm at the tip and 10mm at the widest point. These are well made and look great with the pearloid button. Now you can spend less time setting screws on D-tuners and concentrate on using the tuners when you need them. These really work and don't require any modification to your banjo. By using these tuners it allows you to use the normal pegs on your banjo for tuning without needing to set, un-set or work around the screws on normal D-tuners. EXTRA WIDE Cheat-A-Keys D-Tuners These will fit the Stelling, Bowtie, and the Goodtime, along with almost any of the wide pegheads approximately 5/8" wider than the standard Cheat-A-Keys. These will fit headstocks up to 2 1/2" wide. Cheat-A-Keys - Made in the USA "Quit fiddling with your tuners and concentrate on picking your Banjo" D-Tuners that WORK - REALLY WORK Fast accurate tuning Clamps to peghead - NO DRILLING REQUIRED Fits most Fiddle or Double Cut Pegheads up to 1 7/8" wide Will not fit Stelling Banjos. Deering tuning peg as fitted to Deering and Goodtime Banjos. has a white pearloid button and splined shaft. Has a flat screw for adjusting the torque on the peg. This style of tuner is similar to the original that Earl Scruggs used but the key to this version is it requires no drilling in to the headstock. They go on and come off easy. Again, if you try them and they don't work, you can send them back for a refund. I'm confident you will like them.They are now available in a wide version for Gibson Bowtie model, Goodtime banjos, Stellings or other extra wide peghead! Gotoh Planetary Banjo Tuners in durable nickel finish. These tuners are easy to install and look great. Includes four tuning pegs. Legendary banjo player, Bill Keith, produces some of the finest banjo tuning pegs. Exception quality, built to last a lifetime. 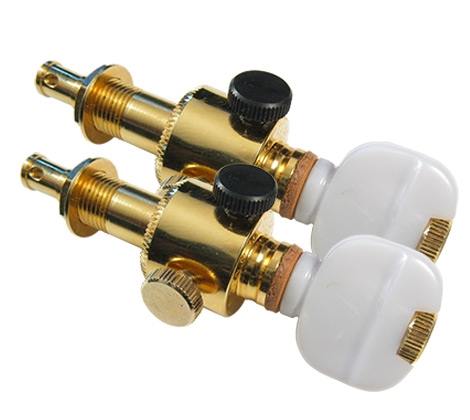 Look good on stage with these staineless steel banjo tuning pegs.